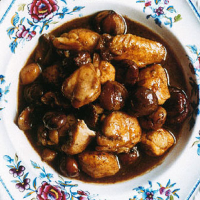 Chicken with chestnuts is a popular combination in many parts of China: this is my version of a terrific stew I ate in Shanghai last year. If you are using a whole chicken, joint the bird into 6 pieces, then chop it, bones and all, into small chunks, discarding the parson’s nose and the bony tips of the legs and wings. If using thighs, simply slice through the bones with a cleaver or large knife to cut similar-size pieces. Crush the ginger and salad onions slightly with the side of a cleaver blade or a heavy object. Heat the oil in a wok over a high flame. When the oil is hot, add the chestnuts and stir-fry for about 4–5 minutes, until they are a little golden. Remove with a slotted spoon and set aside. Add the chicken pieces to the wok and fry over a high heat for 8–10 minutes until they are browned. Remove them from the pan. Drain off some of the excess fat, splash in the cooking wine and stir well. Add the ginger and salad onions and fry for 30 seconds, until they are fragrant. Then tip in the chicken stock. Bring the liquid back to the boil and add the chicken, brown sugar, dark soy sauce and chestnuts; add salt to taste. Turn the heat down and simmer for about 45 minutes until tender, stirring from time to time. Turn the heat up to reduce the liquid if necessary, check the seasoning and serve. Try a deep rosé with the sweetly moist chicken morsels and haunting chestnut richness you’ll taste in this dish.